In the search for an exercise that improves quick ball circulation, includes a lot of pressingsituations where coverage is accentuated, as well as trains orientation under high pressure in and out of possession, I thought of this exercise, which in this or in a different form has been surely seen already by some of the readers. I prefer using this exercise with rather tight spaces with my U13, but also with an U17 in a bit of a bigger space than is shown on the graphics. In a rather tight space there is one zone per player, which is the movement restriction in possession. In pressing the players can press the zone in front and, after their line was bypassed, in their back. 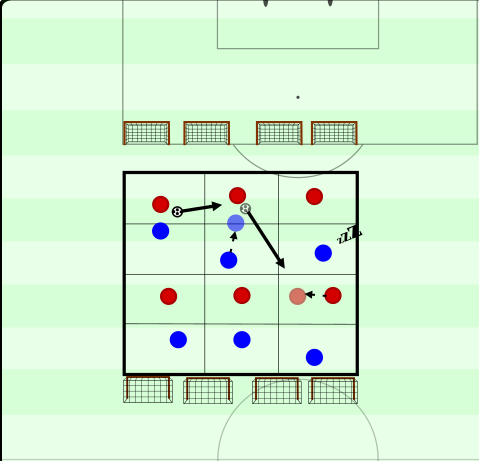 The movement restriction in possession serves to condition the players to hold their positions, but still adapt their positioning in their own area, to make space for themselves or for their teammates. Because of the movement restrictions it is very hard for players to come too close to the ball carrier. Trusting their teammate, as well as smart positioning is of big importance here. In pressing the zones raise awareness for zonal defending, especially regarding distances to teammates, which are to be held short, but cannot be TOO short because of the movement restrictions. Because of the rule, that after being bypassed they can attack the zone behind them, backwards pressing is enforced. The fact that there is four minigoals forces the players in the last defensive line to shift to the borders of their own zones. Would there be three goals, the players would only have to stand in front of their own goal to defend it. But with four they have to adapt their positions to the position of the ball and the teammate, as well as constantly check for the goals and to block or intercept shots on goal. In pressing the players are allowed to attack the zone in front of them (if the ball is in it), or the one behind them, if their line got bypassed. The more passes you play before scoring, the more points you get. It is important though to remind the players that scoring a goal is of highest priority. The players should use patient ball circulation to create gaps in the opposition and not be too risky in their passing. Nevertheless, a pass directly from the first line into goal should be highly rewarded. Per possession each team gets 6 points. The less passes they need to score, the more points they have left. The team with the most points at the end wins. “normal” scoring system with goal =1 point, pass from first line directly into goal=3 points. Because of the tight space, as well as the pressure from both sides, orientation is a very important aspect of this game and constant scanning is of great help. 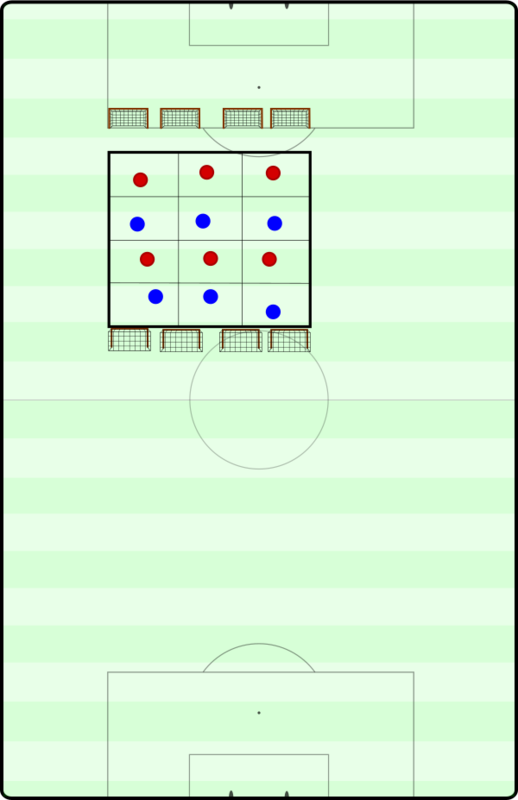 As mentioned in Door 2 and Door 7 it is about giving scanning a direction, so that the players learn what to look for. For the players in the first build-up line the goals are the first orientation point. Looking at the central goals first, the lateral goals will be in peripheral vision, but the coach can guide the players to look explicitly at them as well, if they are being overlooked. The teammates in the second line of build-up are next in the list of orientation check-points. Diagonal options are very valuable and should be coached, if they are not being seen. If there is no shot on goal, nor a pass into the second line possible, then a horizontal pass to a teammate in the first line is the last option. A horizontal pass will make the opposition shift and generate gaps, that can be subsequently used. For the players in the second line checking their shoulder is very important, so they know where the goals and the opponents are. Awareness of their own position, as well as the goal’s and the opponent’s, is very helpful for goal-oriented actions. Teammates next to one, as well as in the first line, are always there for lay-offs. Also in defense orientation should be coached. Of course the ball needs to be an important orientation point, but defenders should be checking their shoulders in order to block passing lanes effectively. Of course verbal communication can help here, even though it is less efficient. The teammate is also an orientation point, as distances to them should remain short. Having an open body position is of upmost importance. It helps with orientation, as the field of vision is directed towards the goal. Additionally, the first touch also is directed towards the goal. In the first line of build-up having an open body position helps the central player to play quick switches, while the outside players primarily have an easier time playing diagonal and vertical passes. In the second line an open body position helps knowing where the opponent and the goals are. Receiving with the back foot and quick follow-up action towards the goal can be done cleaner under pressure. Too often lay-offs are being played, when with an open body position a goal-oriented action could have been possible. Again, in defense body position is important. Through manipulation of body position the opponent can be guided towards certain passing options, the opponent’s actions become foreseeable and thusly easier to anticipate. Keeping intensity high in this small space helps defending properly, if one does not want to be outplayed easily. Constant readiness to press the ball is important and should be coached. Additionally, ball-oriented shifting is necessary to stay compact. Especially in ball-far zones players tend to feel not involved, which can lead to the opposition playing through gaps easily. Ideally, players should get open for passes as far away as possible and only as closely as needed. Especially in the first line players come too close too often and impair their own field of vision and make themselves easily pressured. Also in the second line one should use the space one has as well as possible, position oneself with an open body position in the gaps of the opposition’s defensive line. Awareness of the possibility to manipulate opponents should be raised, if the defender follows the movements of the attacker. This could be used to open passing lanes to the goal or teammates. After losing the ball the closest player should immediately counterpress, while the others should come close to their teammate and cover him, effectively blocking vertical passing lanes. One can also put movement restrictions after losing the ball out of effect, so that several players can attack the ball. One should be conscious though to not let the game become too wild and transition-focused.